SortPlaces Firefox Add-On - Does an automatic sort of your bookmarks ~ Android Forever! Every time you add a bookmark in Firefox, the new bookmark is placed at the end of whichever folder you place it within. I like to have my bookmarks sorted alphabetically by name to they're easy to find. 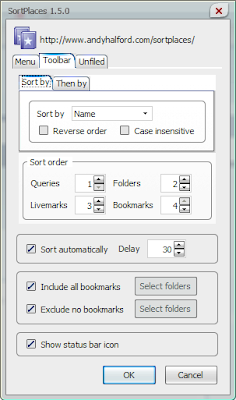 This add-on will sort your bookmarks automatically! Very nice.